Join the discussion on our forums! Come discuss Blood Warriors over in our dedicated Blood Warriors discussion topic. Taunt Warrior playing Fire Plume's Heart will likely be interested in Blood Warriors. With Sudden Genesis coming in Un'Goro, Warriors will have another effect that will take advantage of your damaged minions. Will be interesting to see if a Copy Warrior archetype arises or not. For instance, a Giants Warrior could multiply their board or reload their hand with a 'backup' copy of the cards on their board. I think that with the next expansión we gonna see decks bases un this card and arcane giants Plus aucctionmaster beardo, faceless manipulator and faceless shamblers. Like the ancient echo mage but more based in play spells to survive to the late game and make combos. 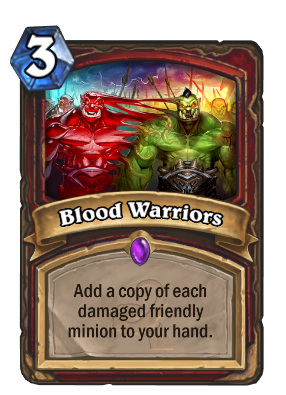 Not only does this card synergize well with Whirlwind but it also works really well with people who run enrage warrior decks like myself and am sick of our Frothing Berserker constantly dying. Good as a 1 of in Patron or Maaaybe Tempo Warrior, it would be bonkers at 2 mana, Play gromm, trade, get another Grom. And that golden animation is badass. This would be so much more useful in control decks that actually need to run Reno and healing minions.... with Justicar available it just isn't needed in Control Warrior. It's in our nature to destroy ourselves! It's in our nature to kill ourselves! It's in our nature to kill each other,It's in our nature to kill, kill, kill! This literally screams patron deck auto-include. Getting a copy of the entire board of patrons + frothing = bliss. http://www.hearthpwn.com/decks/477192-otk-cthun-warrior Maybe a list like this? It's a win more card for sure, and for the class that is least likely to have a strong board presence. I think people are overrating the value this will give Grim Patron. In itself it isn't a great card. You need whirlwind effects. Those effects will most likely be spent on the 2 patrons in the deck already. Dropping a patron with no immediate damage is not that great. This will work bad, only one card draw is clearly not enough. You will find yourself praying for topdecks all the time. I just realized that you can get this from Jeweled Scarab and you can discover Jeweled Scarab from Tomb Spider, which can also give you Fierce Monkey. So it would be possible to make a slightly crappier version of the "concede mage" deck with warrior, but it'll be playable in standard, so it has a higher chance of working!! I swear I thought that you would say that this card is Iluminati, I'm not kidding.